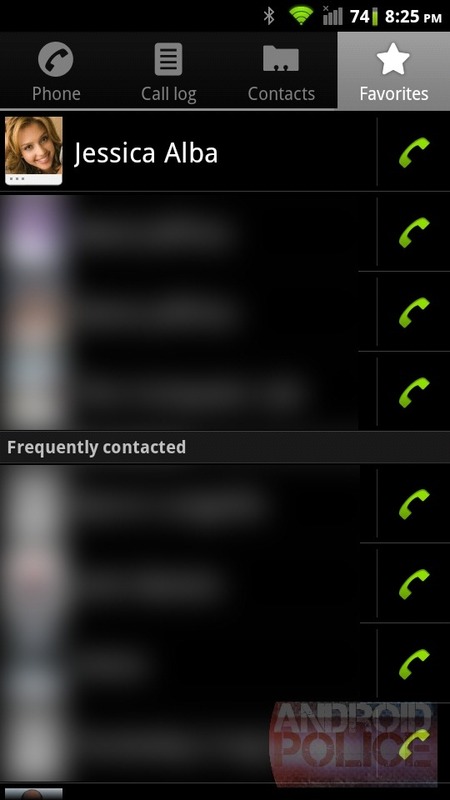 [Getting To Know Android 4.0, Part 5] Everything Changes In Contacts, Even The Name! GTKA4.0 is back! (That's right. We're cool enough to abbreviate now.) Welcome to Part 5: Contacts. The Contacts app has seen the biggest change of any app from Gingerbread to Ice Cream Sandwich. Everything is different. It's not even called "Contacts" anymore, It prefers to be called the "People" app. We've got a lot to cover. Unfortunately, unless you have a Nexus device (I don't), it's almost impossible to get a hold of a fully functional, stock Gingerbread contacts app. The closest I can get is a non-syncing emulator, which doesn't have enough options, and the Cyanogenmod 7 contacts, which has way too many options. So don't flame me too hard if my Gingerbread approximation isn't 100% accurate. But hey, who cares about Gingerbread? The whole point of this article is the new contacts app. I will also probably talk a lot about Google+, but People is not "forcibly" connected to Google+. People has an open data API for social networks, and any app can integrate with it. So don't fret about being forced to sign up for G+ or anything, you don't have to. Deep social network integrating is the biggest new feature. It still connects to Google contacts, but if you install the Google+ app and choose to sync contacts, it will pull pictures, info, and status updates from G+ too. They also demoed Twitter and Linkedin working at the ICS unveiling in Taiwan, but I'm not on either of those networks. Facebook doesn't work, but that's Facebook's fault. Hopefully someone will write a app for Facebook integration. Hmm... Neither app has an "About" screen. That's new. Ignore the branding fail, the new app is actually called "People," they just never updated it internally. 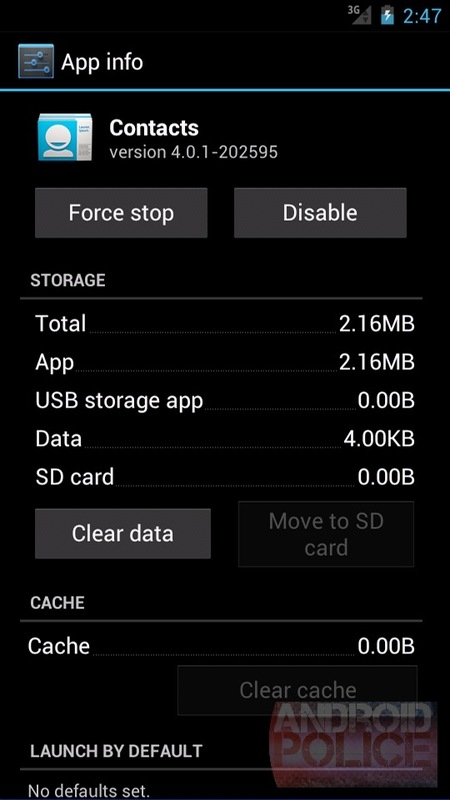 We're moving from 2.3.4 to 4.0.1, both of which are just the Android version number. 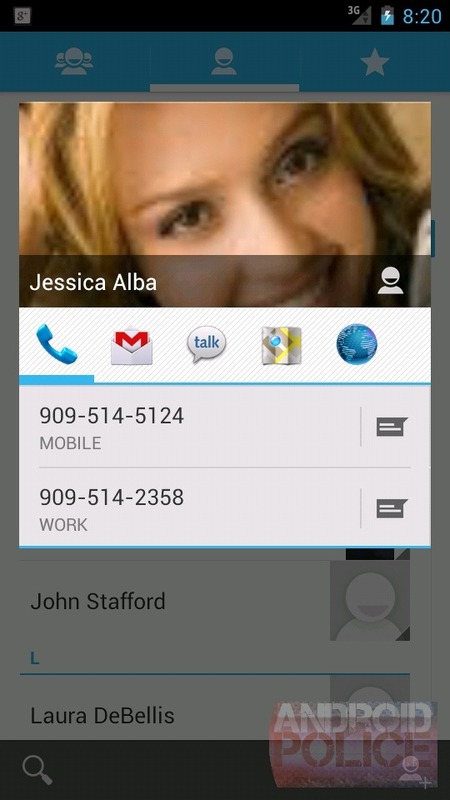 The Gingerbread contacts app was a hybrid of Contacts and Dialer. The new People app is just contacts. Dialer got spun out into its own app, but that's a story for another day. As usual in ICS, we've switched from a black theme to a white one . The AMOLED battery enthusiasts won't like it, but It looks much better. People is the only ICS app I've seen that is infused with a color. The header(action bar) is light blue; every other app has a grey or black header. It's also missing the usual ICS icon/back button in the header. It looks out of place compared to the rest of ICS, almost like a 3rd party app. 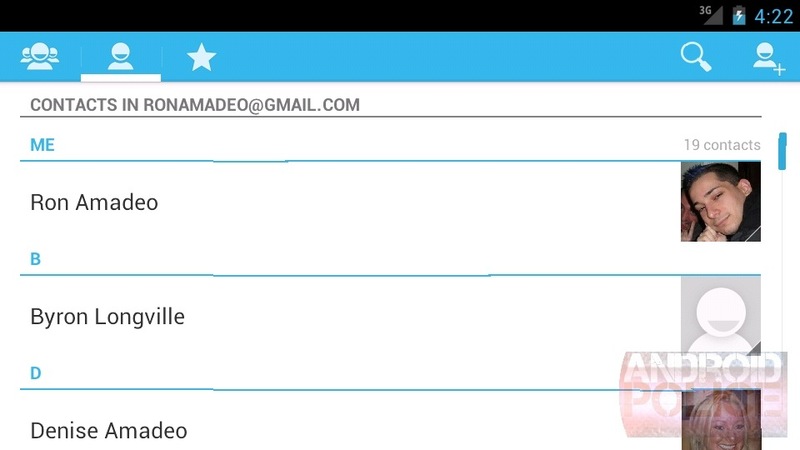 Across the top of ICS there are tabs for Contact Groups, Contacts, and Favorites. 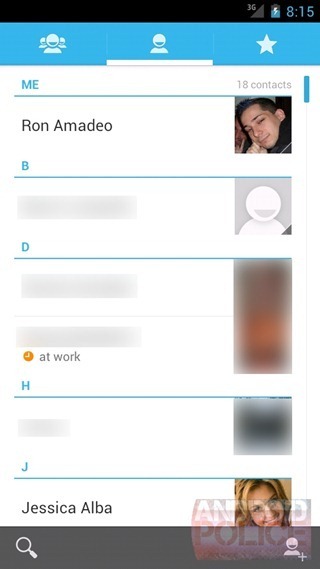 At the top of the contacts list, there's a "Me" contact, with the personal info it pulled from my Google+ account. Tell me, why do I want a "Me" contact? All they said at the ICS unveiling was "this is my phone, and it should know who I am." The thing is, ICS doesn't do anything with this information. Maybe apps will use it? I am very happy to see Google Talk status show up somewhere, It is now right below the names (the orange circle) of your contacts, along with their statuses. Very cool. Along the bottom you have more Action Bar. There's search and add contact. More exposed menu options is always good. I believe the dial buttons are a CM7 extra, In the Gingerbread emulator they are only present in the favorites tab. Sorry about that. 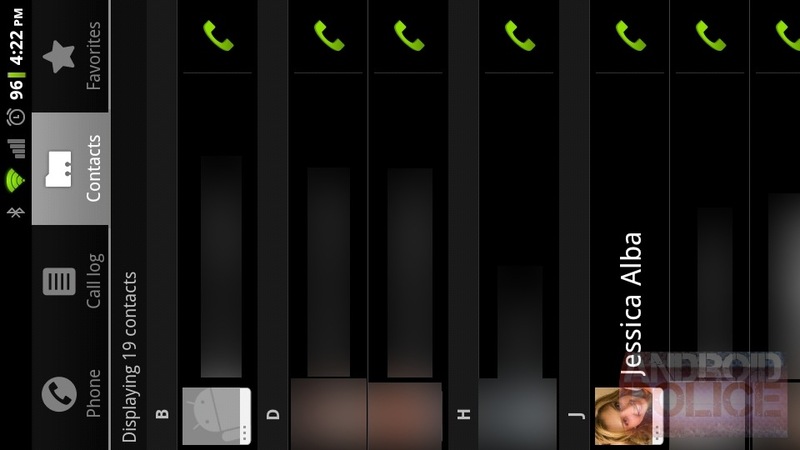 This is the Gingerbread contacts app in landscape. No, I'm not kidding. The contacts list just had no landscape support at all. It's really horrible when you're locked into a car dock and trying to make a quick phone call, and everything is sideways. Luckily, the People app corrects this with a proper landscape mode. Good job on finally supporting a feature that has been around since Android 0.8. (as usual, ignore the horrific emulator landscape rendering). You can also see the Action Bar get its cool "combine" feature going, the bottom bar merges with the top for more vertical space in horizontal mode. Very cool. Contact cards show up when you touch the picture of a contact. It works all over the OS, just like Gingerbread. In ICS though, the cards have gotten a huge upgrade. You now have a giant picture at the top, along with transparent bar showing the contact name and a button for the contact page on the right. 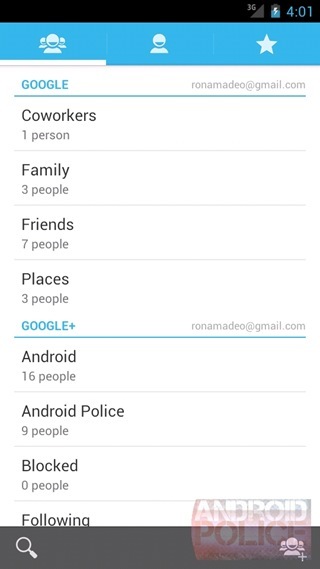 You can touch or swipe through the options for easy access to everything in a normal contacts page. 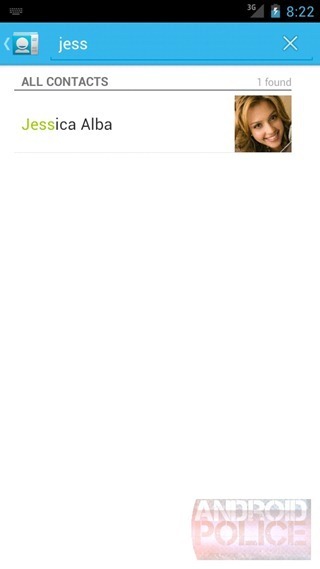 Social networks will show up here too, but Jessica isn't in any. She's shy. I am having serious issues with the pictures. 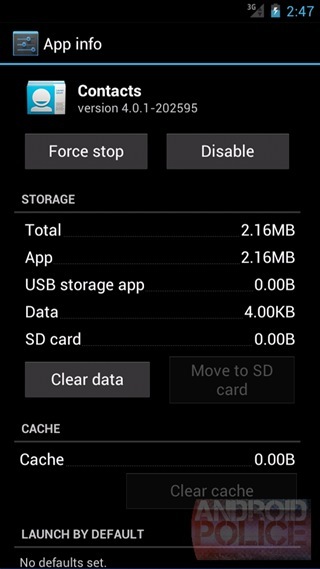 ICS refuses to download high resolution versions, even though I added a super high res picture to contacts. Google either needs to flip a switch on everyone's account to allow higher res pictures, or I'm not getting a full G+ sync. Hopefully Google Contacts has been keeping the higher res versions of the pictures we've all uploaded. Contact cards are even bigger in landscape. Look at that artifacting! We're gonna need some bigger pictures. The favorites tab gets a totally new layout. 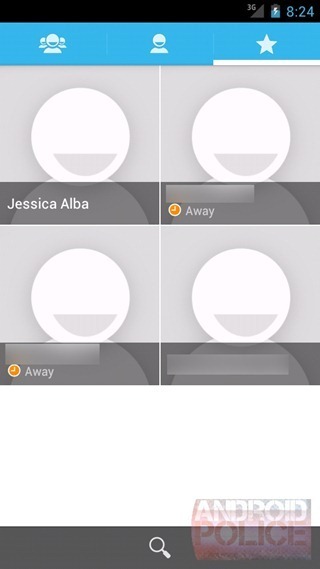 Instead of the normal list of contacts, you get big tiles pictures and a name. You can see more picture shenaniganry here: Jessica has a picture but it isn't showing up. Below the names you also get Google Talk status! Personally I can't have enough status dots. Put them everywhere. That bottom action bar with one button on the bottom is really lame. They really couldn't squeeze that in anywhere else? The horizontal action bar handles the tab/button combo beautifully. I am really going to miss that hardware search button. "Frequently contacted" shows up below the giant pictures in list form. I just haven't frequently contacted anyone. The left tab brings up this screen. 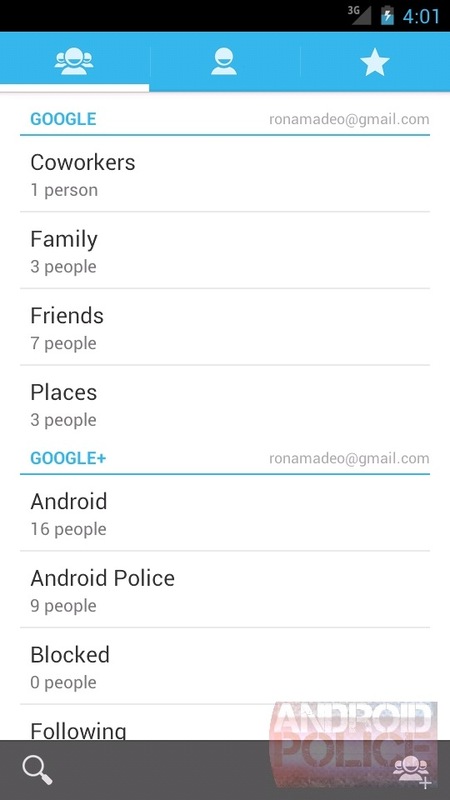 At the top you have the groups from Google Contacts, below that are my G+ circles. Tapping any one of them will bring up a favorites style screen of those groups with big giant images. 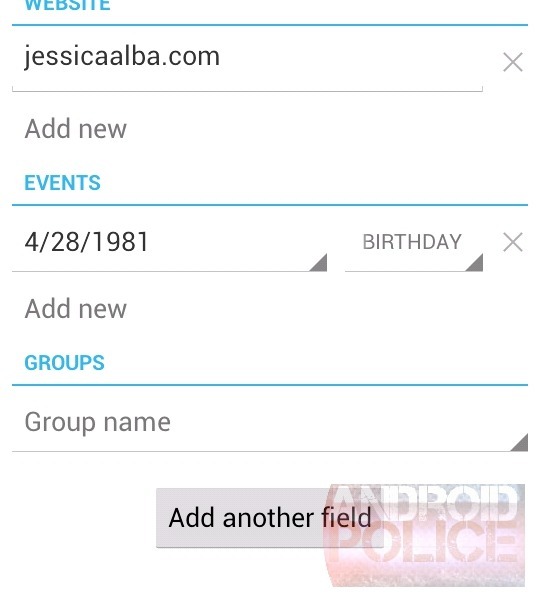 The "Google" contacts will bring up their contacts page, and the G+ circles will load the Google+ app and show their streams. Here's an actual contact page, and Yikes! These two screens show (about) the same about of information. ICS spends a lot of screen space on a giant picture and headings above communication type. Still, I find little reason for Gingerbread's information density. 99% of the time you are looks up a contact for phone numbers or email, both of which still end up on the first screen. No scrolling necessary. "Connections" is the one new item; they should probably rename it "Social Networks." You'll see any social network accounts the contact is associated with. Editing contacts is the complete opposite of viewing one. Here ICS manages to condense the screen more than Gingerbread. 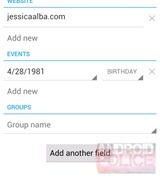 ICS will automatically hide unused sections, so while Gingerbread is wasting space with unused "Notes," "Nicknames," and "Internet Call," fields, ICS neatly tucks them away under the "Add another field" button. The "Done" button lives at the top of the screen now. It is pinned to the screen, (like the "Done" and "Revert buttons in Gingerbread) so you can always find it. "Revert" is totally gone. The back button will also save your changes, so the only way to cancel your changes is to hit menu and "Discard." I personally never "accidently" change a contact and need to discard changes, hopefully everyone else is the same. Really though, that header is awfully empty, there would be plenty of room for a revert button. Just about everything has been switched around. The categories (Home/Work/Mobile) have moved to the right side, and are now in-line drop down boxes instead of full screen dialogs. The colored plus and minus buttons were axed for classier looking "x" and "Add new" buttons. "Address" was switched from 4 separate fields in GB to 1 paragraph-style field in ICS. The separate fields in Gingerbread made entering an address more work than it should be. There's no tab button, remember, so it meant typing a small part of the address, then moving the cursor. Maps is smart enough to figure out 1 line input anyway, so I'm not sure why they ever decided to split it up in GB. 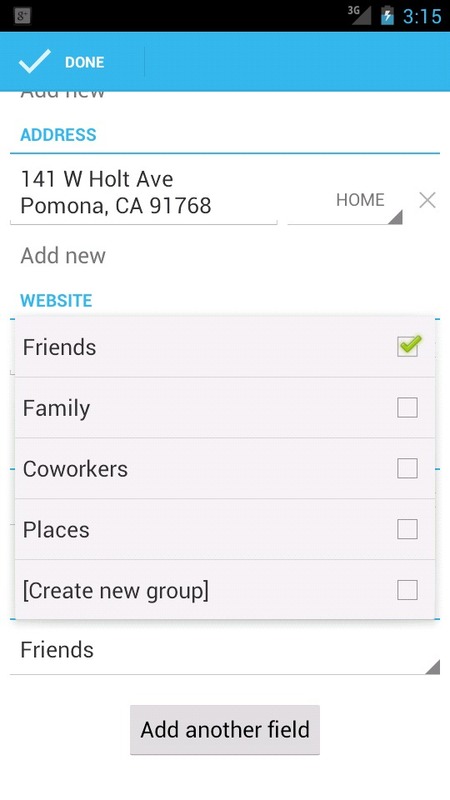 There is one new feature here: You can edit contact groups now (thanks Rita). 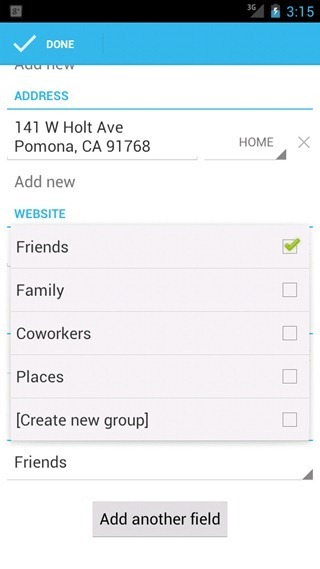 Touching it brings up a set of checkboxes, and you can add or remove a contact from your groups. It's about time we pushed that search button that's been hanging around everywhere. As usual there's the blue header and we FINALLY get to see the People icon/back button. I just love the new results highlighting (the green "Jess" in "Jessica"). It's a small touch but very good looking. There's now an "X" button in the search field that will helpfully erase your entire search term if you'd like to start over. Other than that, it's the usual ICS polish. There is still almost nothing to speak of options wise, you get a mostly empty screen. There's just two options, sort and display by first or last name. What a massive difference. People is now a contacts and social network aggregator. When you can combine contact info from Gmail, Google+, Facebook, Twitter, and Linked-in, you will never have out of date contact information. People takes on a much more visual, picture based design. Everything looks cleaner and is more polished. There's now a proper horizontal mode. It's a nice update and a huge improvement over Gingerbread. [Poll] Do You Use Your Tablet In Portrait Or Landscape Orientation?